Hello and welcome to the Scrapping Our Stash February Blog Hop! For those of you just joining along for this hop, The Scrapping Our Stash Blog Hop is a group of scrappers who are trying to make a dent in their scrapbook supply stash. 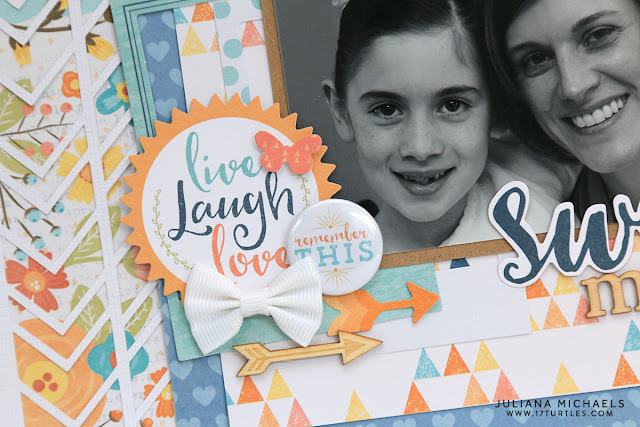 Hopefully you'll be inspired to scrap your stash as well after seeing all the great inspiration along the way! You can check out the full list of those participating this month below. Today I'm sharing a layout I created using the Cocoa Vanilla Life Is Beautiful collection. Swoon indeed! It is seriously one of my faves and I've been hoarding it a little too much. Like hoarding it and not using it. I finally broke down and scrapped this photo of me and my niece together on her first communion. It was a beautiful day and one I can now always remember. To create my background, I used the Chevron Background digital cut file. This is one of my own designs and I'm sharing it with you all today. 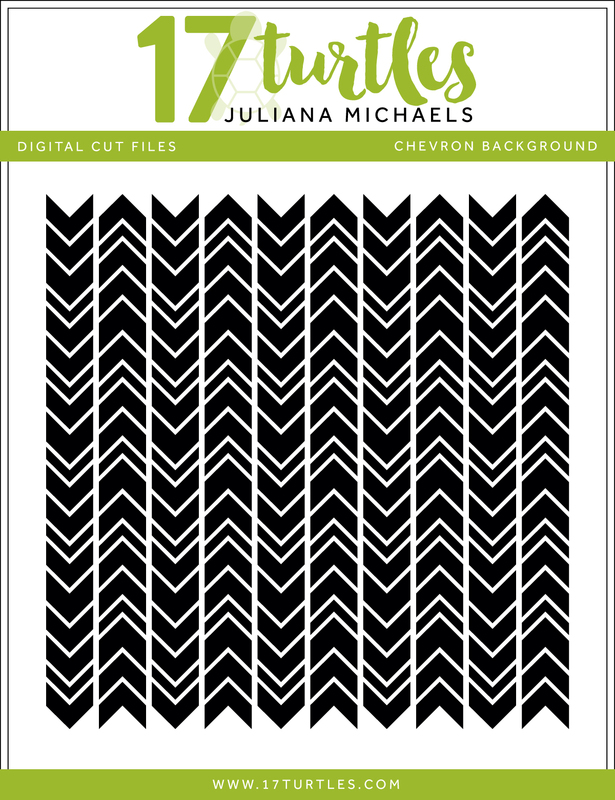 You can download the Chevron Background Digital Cut File below. I created this background cut file to be used as an overlay with a piece of patterned paper. I like how this cut file helps tone down the large bright pattern, but still allows you to see the beautiful floral design peeking through. Here are some close ups of the embellishments I used and layered together to decorate my layout. Isn't that little bow adorable? Thanks so much for hopping by today! So what will you be doing with your scrapbook stash? Sweet layout! Thanks for sharing! The colours on here are absolutely fantastic! Gorgeous page! Beautiful! Thank you for the file! Super cute layout. This cut file is awesome, thanks for sharing. What a fabulous memory and a utterly beautiful page to remember it with! 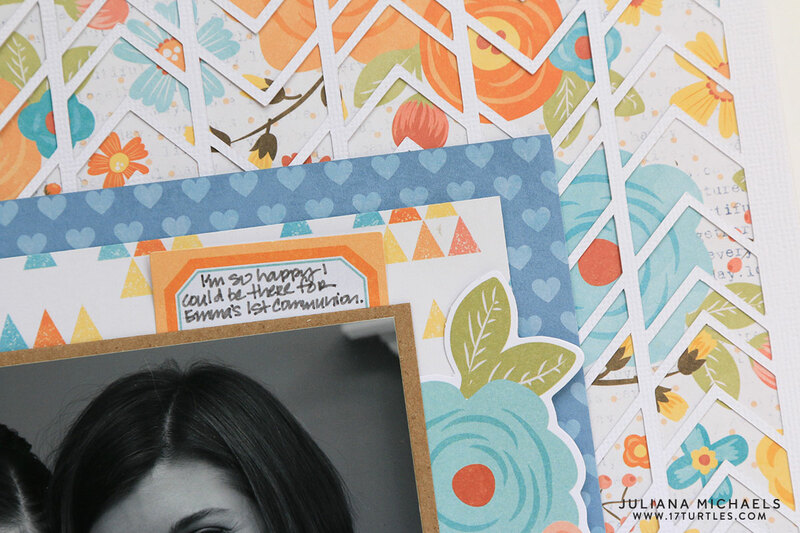 These colors are gorgeous and the cut file is perfect for making the lovely floral paper a little less bold. Thank you so much for sharing the file and all the files that you've been sharing! I finally did a little blog hop of just your blog to download a ton of them since I finally figured out what I was doing wrong when I tried downloading them in the past. Such lovely colors to highlight a beautiful memory! Love your layouts and cutting files. Thanks so much. Beautiful page Juliana! Love the cut file, TFS! What a wonderful layout. The cut file looks so perfect. Thanks for the file and the inspiration. Stunning layout. Beautiful colors! Thanks for the cut file! Your layout is fabulous! I can't wait to try out this chevron background....thanks for the freebie!!! Hi, great designs on this blog! I would love to use some of them in my next scrapbooking project, but I noticed that the files are no longer being shared on Box. Is it possible to make them available again on box? Thanks! Hi! As far as I can tell the link is still working. Maybe just again.